Home and after a hot bath along with some sleep and then some more sleep, we are nearly unpacked following a weekend long archery competition. It was the annual NFAS 3D championships and it proved to be a really great weekend, despite the best efforts of the British weather to drown us all. For those of you reading this and don’t know the 3D champs are one of 3 championships the NFAS run throughout the year. 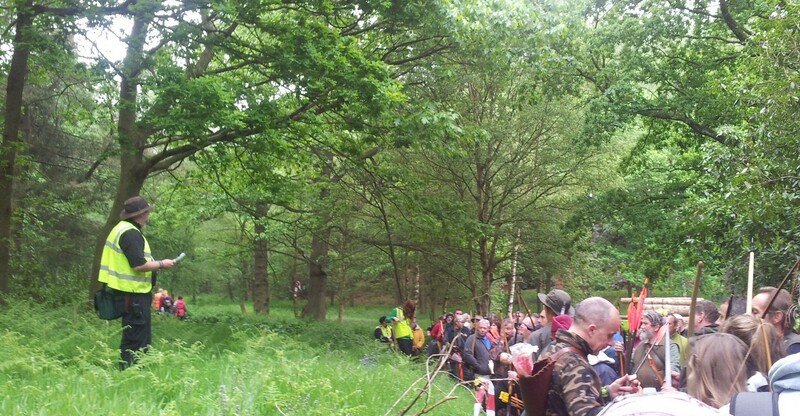 It is normally well attended with over 700 archers,this year there were a few less though, probably due to the economic climate. We’d decided to camp for the weekend rather than driving up each day, so headed to just outside Osmaston Park, near Ashbourne in Derbyshire on Friday night to pitch tent and meet up with everyone. We joined up with the Artemis guys in their marquee and had some food and a few drinks. Thanks guys. 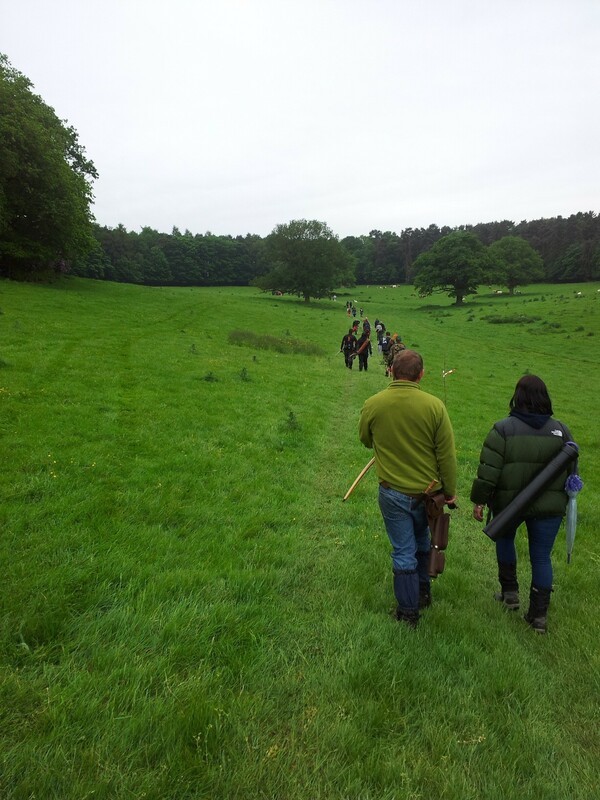 This year there were 4 courses in total A&B for wooden arrows, X&Y course for metal / carbon arrows. By splitting it in this way courses can be tailored to suit class. Before I go any further can I say a big thanks to Hanson club who provided the catering at Admin and Y course, it was great to have hot food and not just burgers, but steaks, cakes, and fantastic apple pie. They started at 7:30 am and went on until gone 7 pm. Thank you so much. 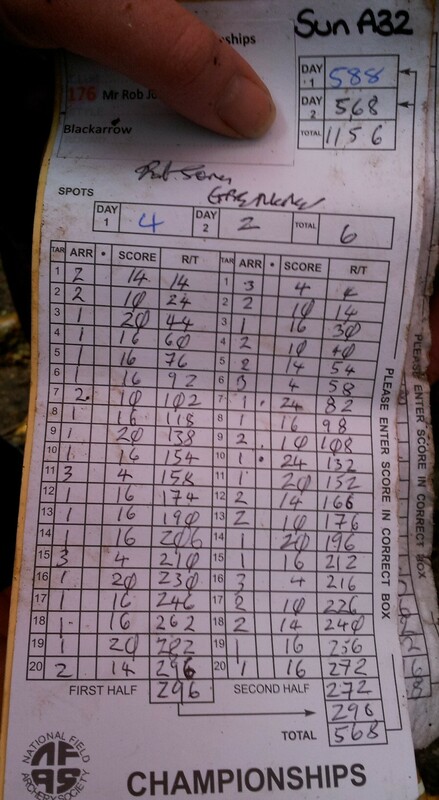 Over the course of the weekend archers shoot 2 courses 1 on Saturday and 1 Sunday. Each course consists of 40 3D targets of varying sizes shot over a range of unmarked distances and elevations. The 2 courses I shoot were, course A laid by Cheshire Oak and Course B was done by Pride Park. 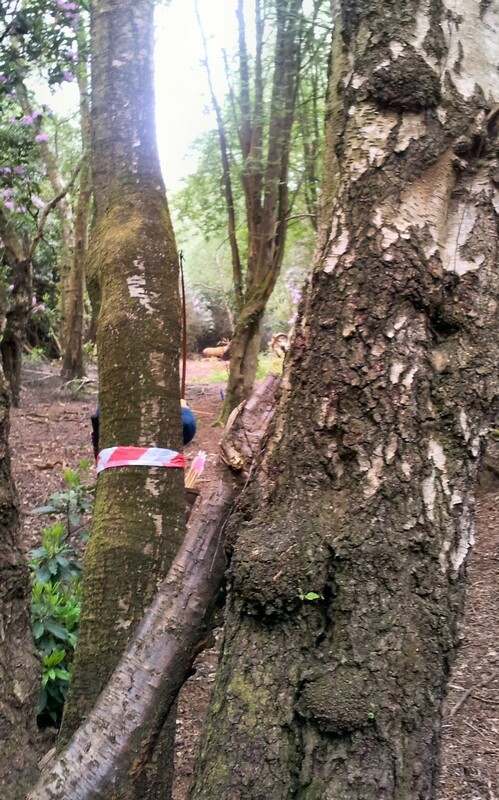 Think A course was fortunate enough to have the better terrain to work with as the problem B course had been a large fenced off area which was off-limits. This limited long shots so they worked on using dead ground and foliage to trick archers and frame shots. I went up to a few target and thought this was easy and then needed a second arrow or third. The course was designed so you passed catering twice so you could grab some food. After our first break the target below was what greeted us, a velociraptor 3D at an angle. I later found out it was over 50 yards away, so I was really happy when I got it with the first arrow. 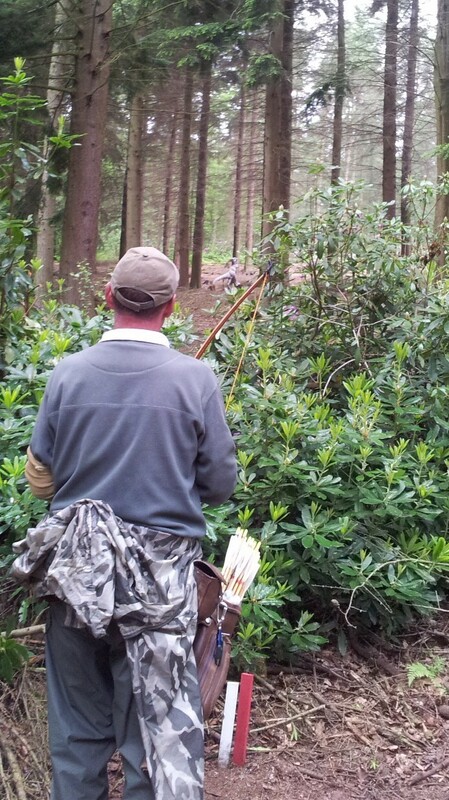 Below you can see Mark about to shoot it with his longbow. Sunday was wet, very very wet, quite a few people retired due to the weather and this is why there are no photos of Sunday, wanted to try to keep phone dry. I would have liked to shoot the Cheshire oak course in the dry as Sunday resembled a monsoon at times. Glad I took a large brolly. Quiet a few people who were camping stuck around on Sunday night rather than trying to take their tent or caravan down in the rain. So saw quite a few sore heads on Monday. 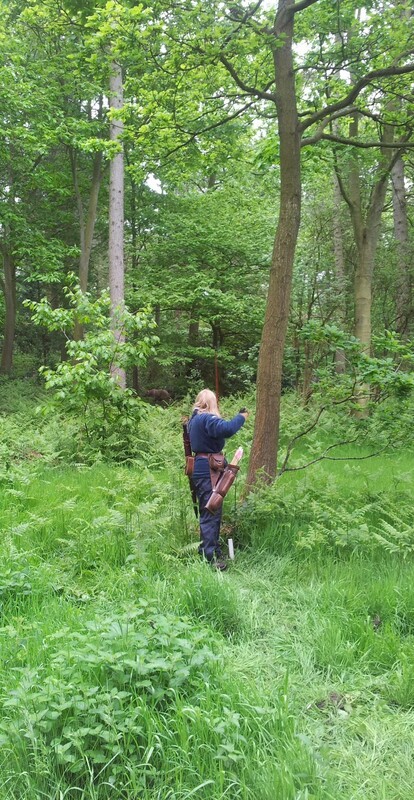 We’d decided to stay so that on Monday we could give the organisers a hand to take stuff down and walk one of the courses (x course laid by Yorick archers) to check for any lost arrows, clear signs etc Glad I took the metal detector as found a load of crossbow bolts and arrows. So how did I get on ? 30th in AFB and considering my lack of practise time I’m more than happy with that. Only blanked 1 target over the whole weekend too. Sharon won bronze (3rd place) in ladies BareBow which I am very proud of since she has been shooting this new bow (Andy Soars Black Brook bows) for a bout 5 months. 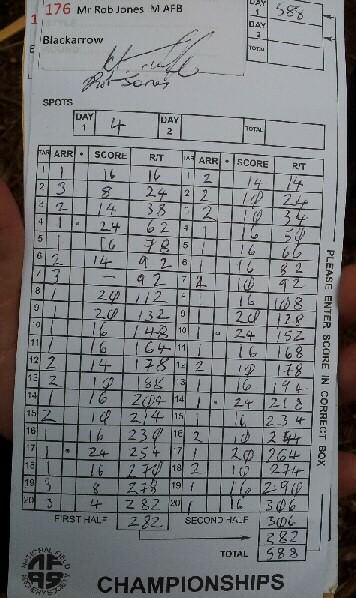 Congrats to Andy Soars too who won Gents Barebow. Nice report that uphill dino after the tea tent was a bit of a swine. It was a bit of a tough shot, straight after having a lunch break too. Anyone under 5ft 8″ would struggle to see it clearly.